Every boatyard needs a railway. It is the only way to launch a boat. 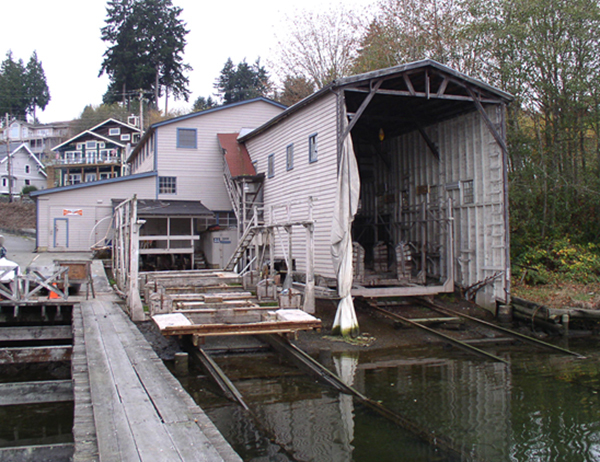 After Eddon Boatyard was purchased by the City of Gig Harbor in 2006, both marine railways were removed as part a site clean-up action. Engineered Plans and Permitting are in place but finding funds to complete this work has been difficult. With over $1.5 million invested on restoring the building, pier, and float - Gig Harbor BoatShop and its generous membership of community supporters have raised over $130,000 for the marine railways. To date, all of the in-water piling are in place and the interior railways (under the boatshed) have been installed. Gig Harbor BoatShop continues its efforts to raise funds for the remaining railways and completion of the two carriage systems through national and state grant funding. If you are interested in contributing to the Final Phase of the Historic Eddon Boatyard Restoration Project that began in 2006, please consider donating to this important community-owned facility. The first image below shows the interior and exterior marine railways in 2006. They were removed as part of the clean-up action that was completed in 2008. Thanks to generous donations from Gig Harbor BoatShop members, 56 marine railway piling were installed in 2014. A rendering of the finished marine railway systems (interior and exterior) created by John McMillan that meets current environmental regulations is permitted for construction.